A sophisticated half-traditional, half-modern South African painter, whose images are a pleasure to view uses the services of Giclée Fine Art to produce prints using both some new developments, as well as the traditional paper and canvas, all aimed to promote the artists character and depth. Promoted by one of the best London galleries, the artist uses evocative images and framing to give a richness and depth to her work. 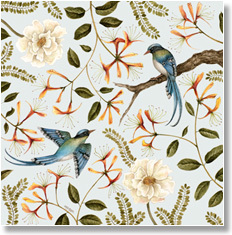 She has now launched a series of exquisite prints, inspired by antique Oriental wall paper and floral patterns.